A modern Chinese painting has been sold at auction in Beijing for more than $65m (£40m). The high price paid for the painting shows the strength of the art market in the world's second-largest economy. According to one survey China overtook the US last year to become the most valuable art market in the world, accounting for 33% of total sales. The painting was sold at auction for 425.5m yuan ($65.5m) after more than half an hour of bidding, according to the auction house China Guardian. This is the second-highest amount paid for a piece of art at auction in mainland China. An 11th Century scroll by the Chinese calligrapher Huang Tingjian fetched 436.8m ($67.2m) yuan in 2009. 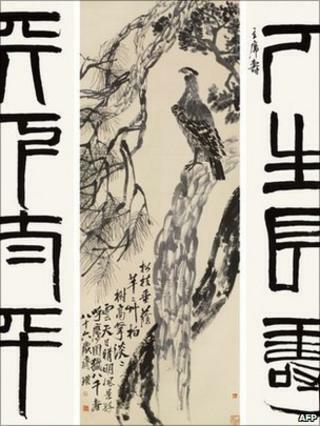 Qi Baishi's work was painted in the 1940s for the man who then led China, Chiang Kai-shek. It was intended as a gift for his 60th birthday. Born in Hunan province in 1864 and largely self-taught, Qi is noted for painting natural scenes. "His paintings have not only affected numerous people inside China, but have won global respect," said Guo Tong of China Guardian. Mr Guo might say so, but few people outside his native country will have heard of Qi. He is, however, is one of a clutch of Chinese artists whose work sells well at international art markets. In the last few years Qi's paintings have sold for nearly as much as more established household names, such as Pablo Picasso and Andy Warhol. That is partly driven by China's booming economy, which has produced an increasingly large number of wealthy individuals willing to pay high prices for sought-after pieces of art.